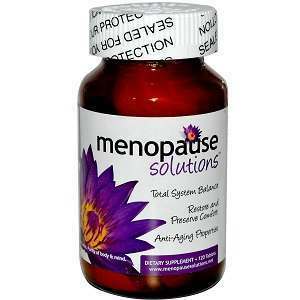 Pure Solutions Menopause Solutions addresses the system imbalance that occurs during menopause and helps restore balance and comfort. It keeps both the body and mind healthy and also has anti-ageing properties. Specialty Bound Protein Amino Acids (Proprietary Velvet Antler extract): Reduces hot flashes, night sweats, pain associated with menopause and also increases sexual libido. It has been found to be good for the nervous and cardiac system as well. Vitamin B12: Decreases mood swings and anxiety. Calcium citrate: Essential for bone health. Licorice root: Contains antioxidants, which delay ageing and prevent cell damage. Licorice root also keeps the pancreas healthy. Black cohosh: Rich in phytoestrogens, which reduce the symptoms of menopause that are basically due to the lack of estrogen. Wild yam: Contains estrogen precursors, which in the lab setting have been converted to estrogen. Supposed to reduce occurrence of hot flashes and night sweats, but there is no proof of its effectiveness. Valerian root: Antianxiety and sedative properties that help curb menopause related sleeplessness. Chaste tree berry: Mimics estrogen and progesterone and inhibits prolactin formation. This reduces menopausal and even menstrual symptoms like irritability, insomnia, depression and painful menstrual flow. Dong Quai: Helps restore hormonal balance and reduce the symptoms of menopause. 2 tablets of this supplement should be taken twice a day. It should ideally be taken on an empty stomach and should be chewed for 90 seconds before swallowing. For severe night sweats, the night dosage can be increased. The standard retail price for a 120-tablet bottle is $49.95, but it is available on third party websites like iHerb for a discounted price of $37.46. There is no guarantee available on this product and most websites seem to have discontinued its sale. Jackie Horowitz	reviewed Pure Solutions Menopause Solutions	on October 7th	 and gave it a rating of 2.